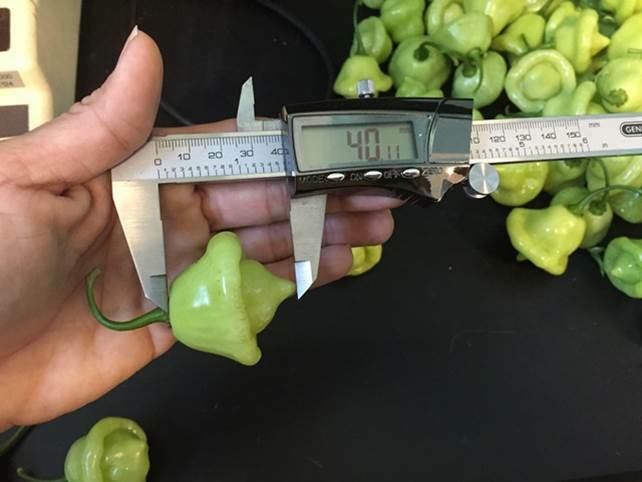 Ají dulce has the shape and size of a habanero pepper (Figure 4) without the taste of intense heat. Unlike many other countries in Latin America, hot peppers are not commonly used in the cuisines of Puerto Rico, Dominican Republic, or Cuba. Some ají dulce fruit, however, is pungent, most likely due to cross-pollination with habaneros or other spicy C. chinense peppers. Spicy ají dulce has become a serious issue for sales of ají dulce in markets in the United States. 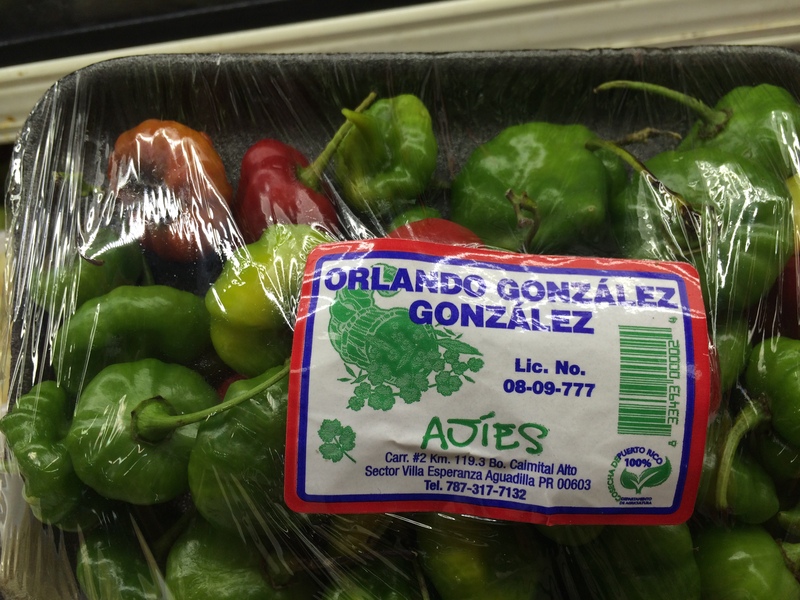 Many Latino consumers and markets in the US have become circumspect of ají dulce due to purchases of spicy ají dulce, which has negatively impacted sales. 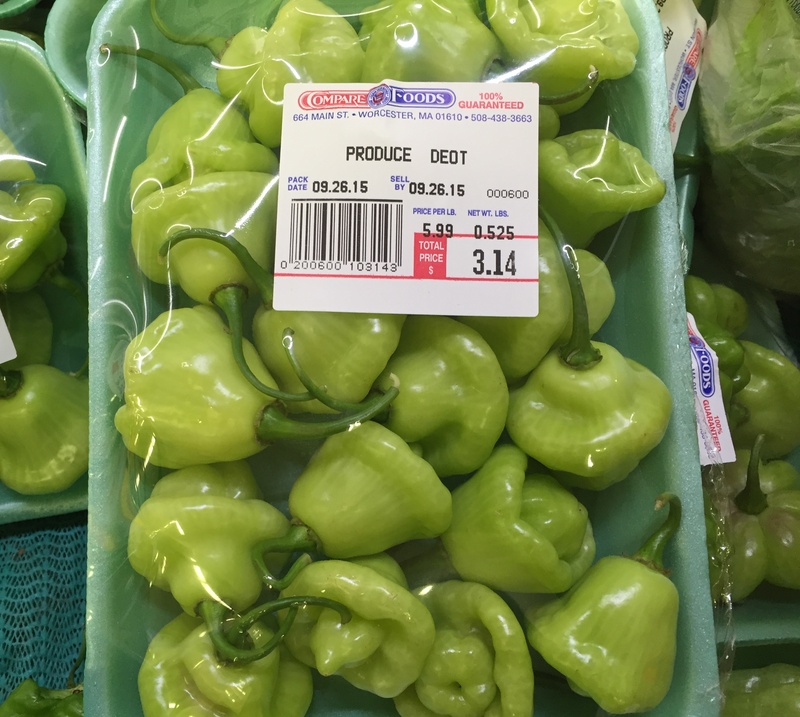 Some consumers have switched to other sweet peppers as a substitute, such as cubanelle and bell peppers, due to the concern that the ají dulce in the market could be hot. Ají dulce is used to season dishes in Puerto Rico, Dominican Republic and Cuba. One of its most common uses is as an important ingredient for sofrito (Figure 5), a fragrant, savory mirepoix used in several Latin American cuisines. (Sofrito, which translates to “stir fry” or sauté in English, is traditionally not either. The ingredients are blended/finely chopped and added to dishes (See Sofrtio Puertorriqueño in references) (Figure 6). 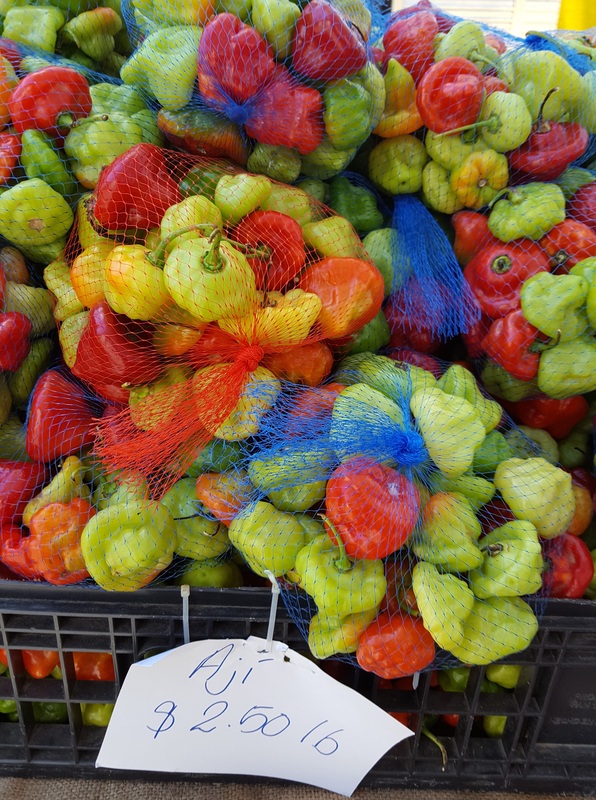 In markets in Puerto Rico it is common to find the key ingredients for sofrito, including ají dulce, pre-packaged (Figure 7). 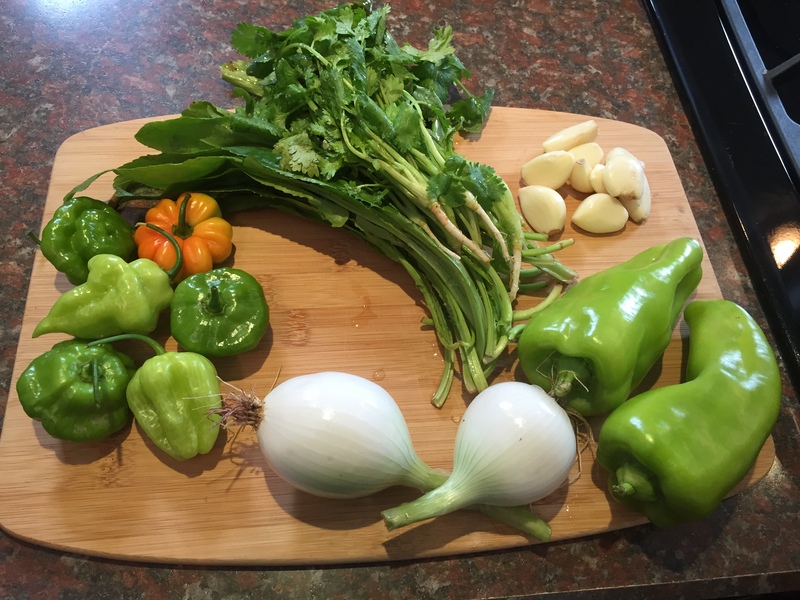 Many Puerto Ricans will grow the key ingredients for sofrito, including ají dulce, in their huertos (backyard gardens) so they can make fresh sofrito, speaking to its’ popularity (Figure 8). There is a similar sweet pepper used in Venezuelan cuisine. In 1998, two types were observed in markets in Barquisimeto Venezuela, criollo and oriente, translating “local” and “east”, as in from Eastern Venezuela, respectively (Figure 9). These peppers are also C. chinense, but are usually slightly spicy; however, not anywhere near as spicy as habanero or scotch bonnet. The quality of this type of ají was far superior during market visits in Barquisimeto in 2009 (Figure 10). Ají dulce, like all peppers, has its center of origin in the tropical Americas and will die with a frost (Figure 11). In fact, it is now known that ají dulce, and all Capsicum chinense peppers, have their center of origin in the Brazilian Amazon. Researchers established that Native Brazilians brought C. chinense to the Pacific coast and Spanish colonists brought C. chinense from what is now Peru to Mexico and the Caribbean and Yucatan of Mexico (Brown, et. al. 2013). C. chinense was selected for high heat in Mexico and the English-speaking Caribbean Islands (e.g. habanero and scotch bonnet). In the Spanish-speaking Caribbean Islands it was selected for sweetness. Despite the fact that ají dulce is originally from the Amazon it grows well in the Northeastern United States, as do most pepper varieties. 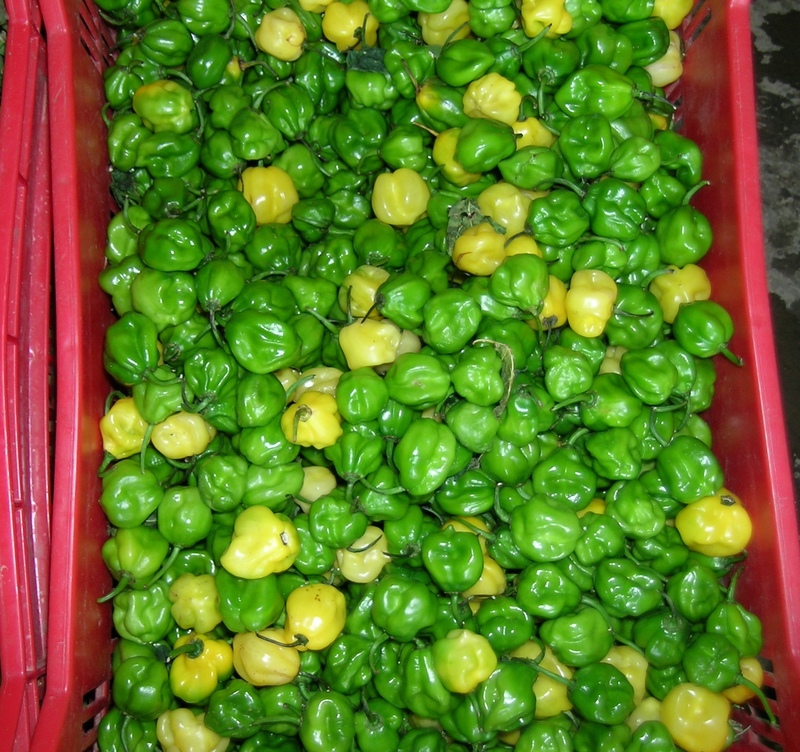 There is a C. chinense pepper, pimenta de cheiro (flavorful pepper in Portuguese) still used in the Northern parts of Brazil as a mirepoix called chiero verde (green aroma in Portuguese) (Figure 12). One can buy the main ingredients for chiero verde in markets in Northern Brazil, which include culantro, cilantro and scallions, in addition to pimento de cheiro (Figure 13). Interestingly, these ingredients are very similar to the ingredients for sofrito. 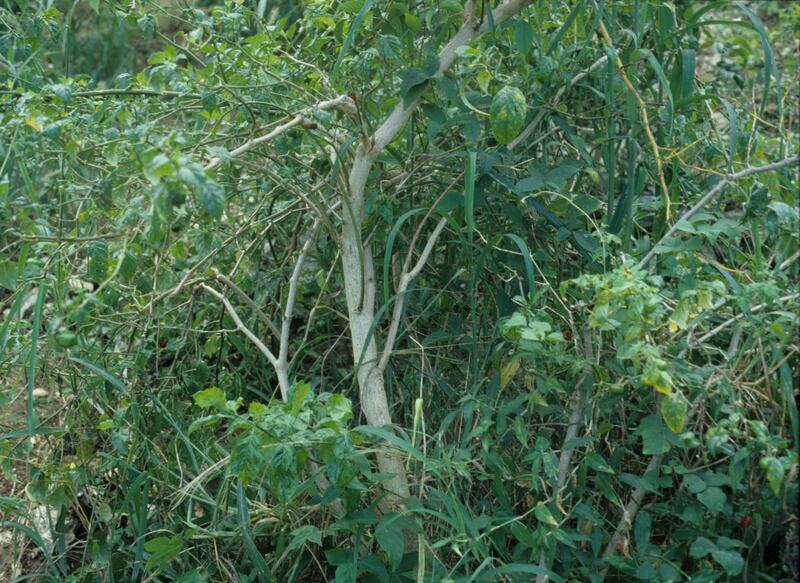 In the tropics, ají dulce can grow as a perennial (Figure 14; Figure 15), as can many pepper types. However, most commercial production in tropical regions is with annual systems similar to the Northeastern United States. As with all peppers grown in the Northeastern United States, ají dulce has to be started as a transplant. In some regions in Southern United States and tropical regions, peppers can be direct-seeded in the field, but transplants are commonly used, including with ají dulce. 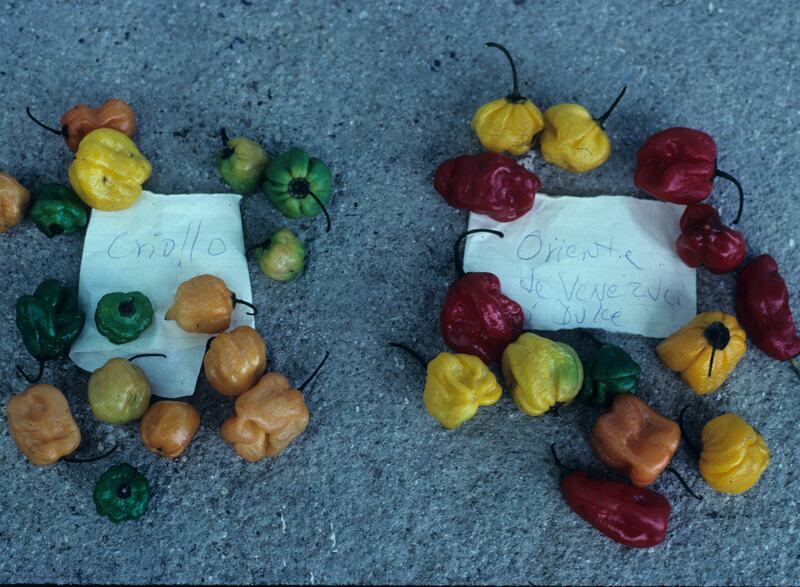 Ají dulce and other C. chinense plants grow much slower than bell and other C. annuum peppers. 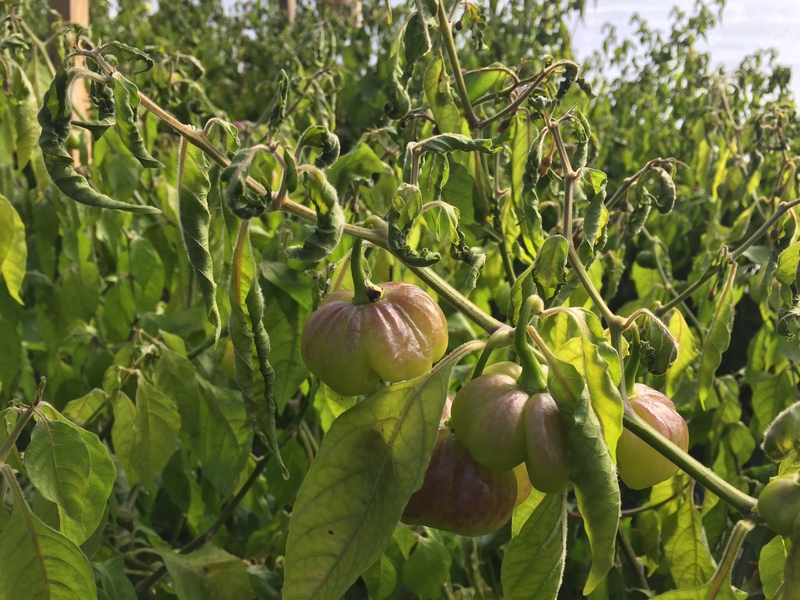 For this reason, ají dulce seeds have to be started earlier in a greenhouse in the Northeastern United States than bell peppers in order to ensure earlier fruit production in the field and higher yields before frost. In 1997, several ají dulce varieties provided by the University of Puerto Rico at Mayagüez were evaluated at the UMass Research Farm in Deerfield. 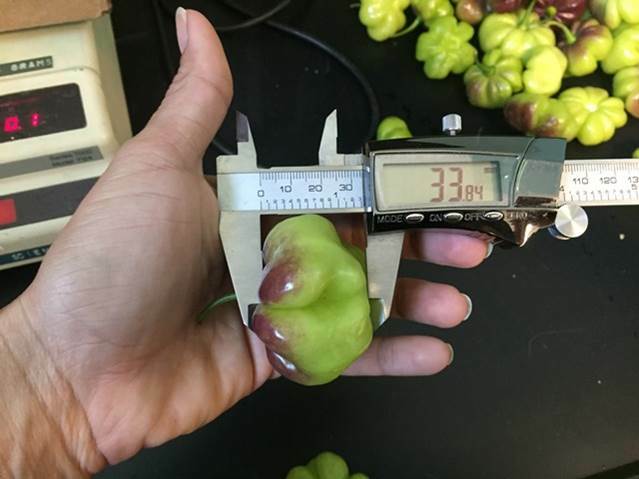 In this project, ají dulce seeds tarted in a greenhouse on April 1 (when we usually start bell pepper seeds in Massachusetts) yielded less than 3,000 lbs./acre of marketable fruit. Ají dulce seed started on March 9, as part of the same trial, yielded over 13,000 pounds/acre of marketable fruit (Mangan et al., 2000). In 2015, trials were again implemented at the UMass Research Farm with selections of ají dulce from the University of Puerto Rico Mayagüez. Seeds were started in the greenhouse on March 10 and yields averaged 27,461 lbs./acre over four types in an open field (Figure 16) and 38,018 lbs./acre in a high tunnel (Figure 17) with the same four types.The yields of the four types grown in an open field yielded the following, (lbs./acre): “Carnaval”, 34,190 (Figure 18), “Amanecer”, 32,458 (Figure 19), “Encanto”, 23,970 (Figure 20) and “Pasión”, 19,226 (Figure 21). The yields were higher when grown in a high tunnel, also known as an unheated greenhouse, (lbs./acre): “Carnaval”, 49,144, “Amanecer”, 41,471, “Encanto”, 38,238, and “Pasión”, 23,221. 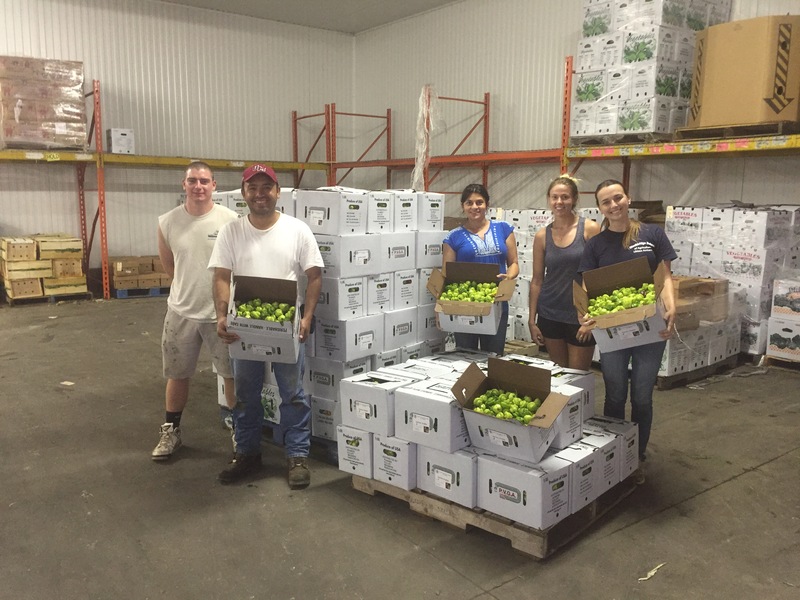 The use of high tunnels has grown in the Northeastern United States, especially for the production of crops that respond well to higher temperatures, such as fruiting Solanceous crops, including peppers. High tunnels will not protect a crop from a killing frost. However, there can be a dramatic increase in plant growth, especially early in the season, by closing up the high tunnel during cool temperatures. Temperature differences between inside and outside of the high tunnel can be in excess of 40°F early in the season. In addition, the high tunnel protects the foliage from rain, which decreases disease incidence. Water is supplied to plants via drip irrigation. 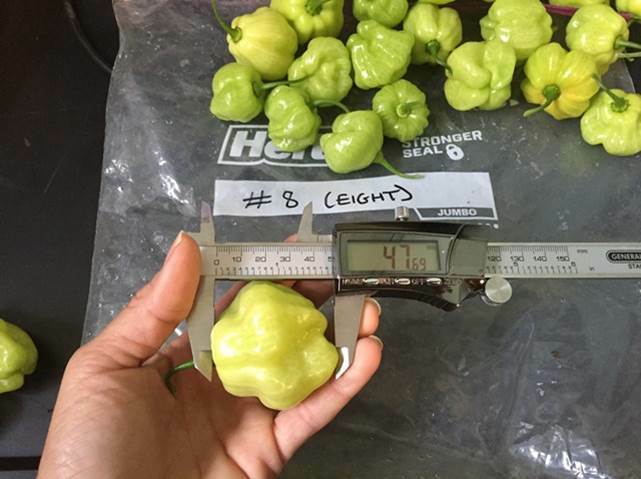 For these reasons production of peppers in high tunnels can provide both earlier and higher yields. This is demonstrated with ají dulce trials planted in both a high tunnel and an open field at the UMass Research Farm in 2015. 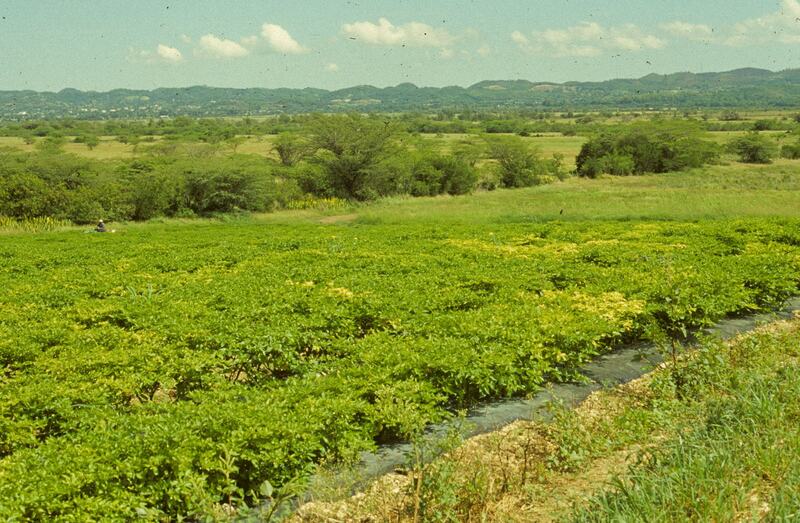 Figure 22 shows ají dulce plants in an open field on June 17 and Figure 23 shows ají dulce plants in a high tunnel. The higher yields in 2015 compared to 1997 are probably due to the use of black plastic, raised beds, and drip irrigation in 2015; in 1997, the plants were grown in the field without plastic, drip, or raised beds. Dr. Robert Bernatzky, a breeder at the University of Massachusetts, found pepper mild mosaic virus (PMMoV) on several selections of ají dulce peppers from Latin America (Figure 24). This virus will not cause a complete loss of yield, but it can decrease yields. A greater concern is that this virus is seed-borne, so saving seed from infected plants is not recommended. 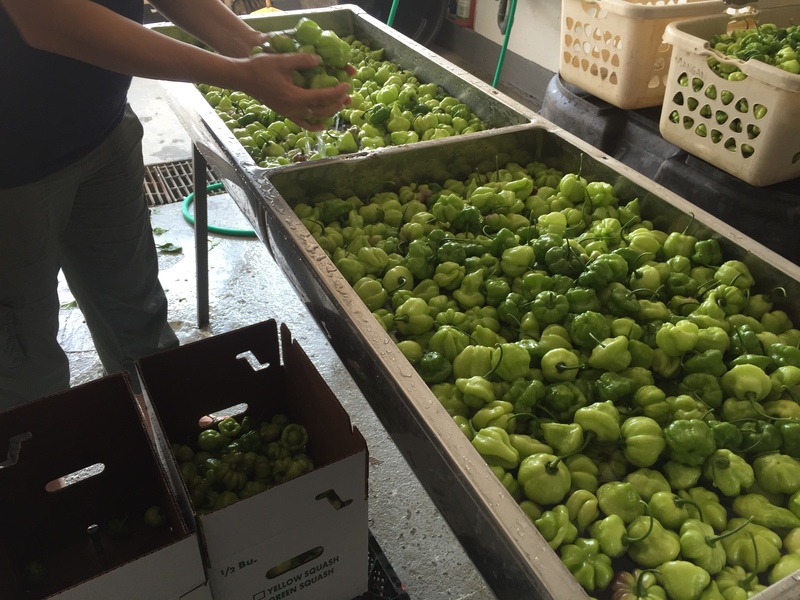 Although the virus can spread from plant to plant through rigorous mechanical efforts, casual handling of infected fruit and seed followed by handling of non-infected seed does not transfer the virus to the clean seed (Lamb, et. al., 2008). 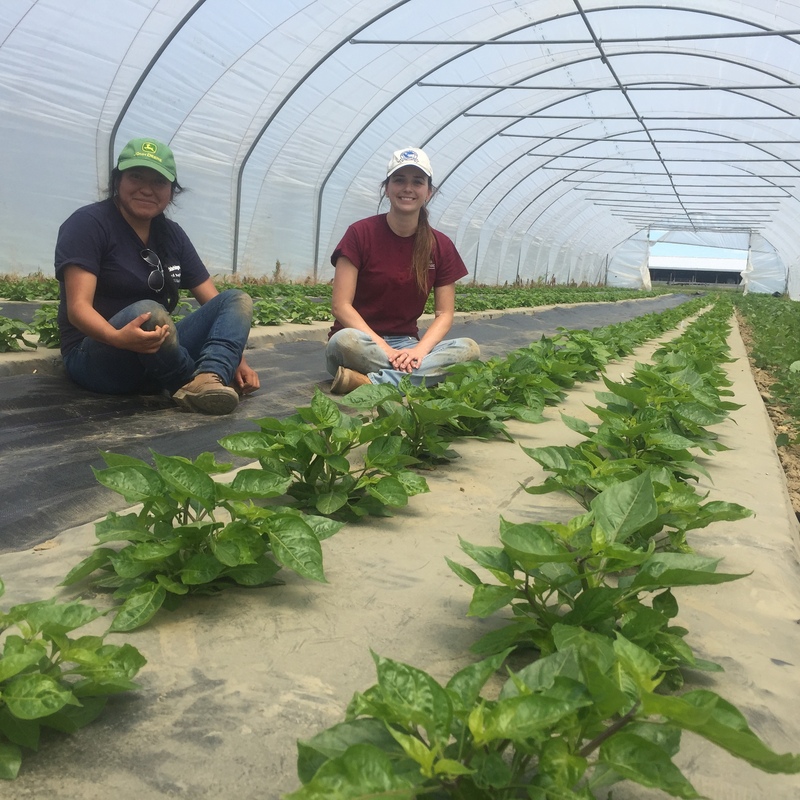 When we grow ají dulce at the UMass Research Farm we plant two rows of peppers on black/degradable plastic with one foot in the row. Our plastic is laid six feet on center (6' from the center of one row of plastic to an adjacent row), for a total plant population of 14,480 plants/acre (Figure 25). 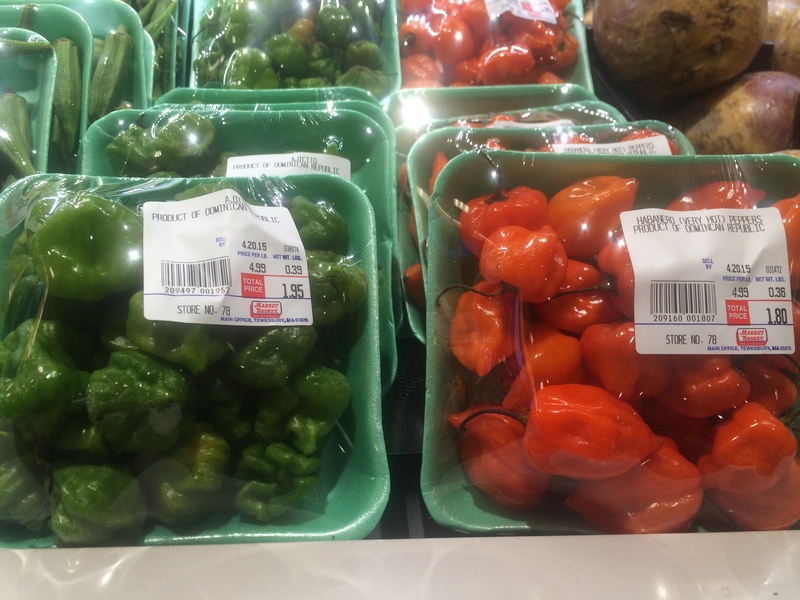 For information on production and management of ají dulce, refer to the New England Vegetable Management Guide and click on "peppers," keeping in mind the differences in production compared to Capsicum annuum types described above. 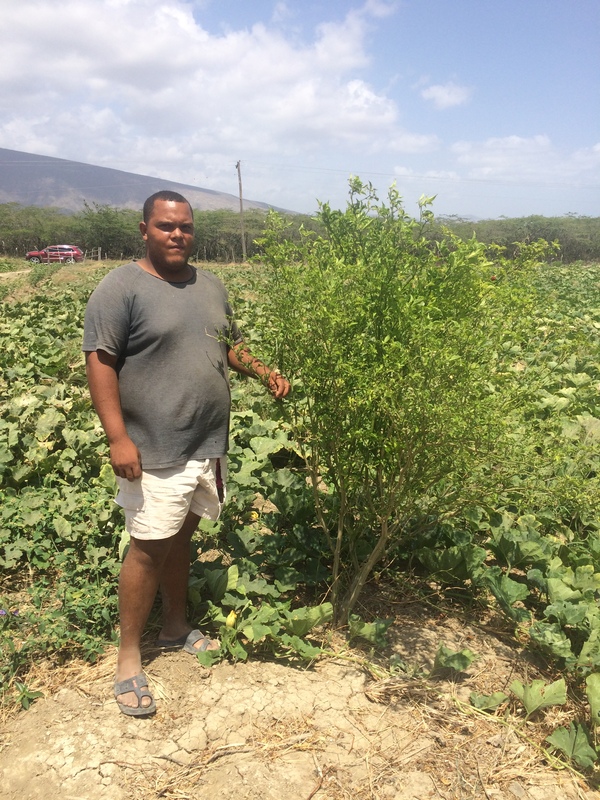 In the Caribbean, farmers will save seed from mature ají dulce fruit for their next crop, and farmers in Massachusetts have been doing the same. 1. “Ají dulce” and/or “ají cachucha” and/or "ají gustoso" combined with “seed”. 2. “Capsicum chinense” combined with “seed”. You will most likely find “hits” with sites that have ají dulce seeds, or what looks like ají dulce. You then want to make sure that the seed a particular company is offering is in fact ají dulce. It is recommended to contact the seed company to get assurances that the seed is definitely ají dulce. It is recommended to grow small amounts of the purchased seeds to ensure that the fruit is in fact ají dulce. One way is to find ají dulce in Latino markets and save seed from mature fruits. In the Latino market, look for fresh ají dulce that has the characteristics that the market desires and buy some. You’ll want to taste them to make sure they are sweet. If there is any pungency, this fruit is not a good candidate to save seed. If it is sweet, it is then recommended to ask a Puerto Rican or Dominican to taste them for you to make sure they have the unique flavor the market desires. Then you can save seed from this fruit. See these videos on how to save ají dulce seeds. One is in English and another is in Spanish (español). We wash ají dulce peppers in a dunk tank with chorine added to achieve 150 ppm of available chlorine (Figure 26). We don’t use a vegetable washer with brushes, which we use with larger peppers, because the ajíes are too small and fall through the brushes. Ají dulce imported from outside the US is normally packed in a mesh bag with 25 pounds (Figure 27). 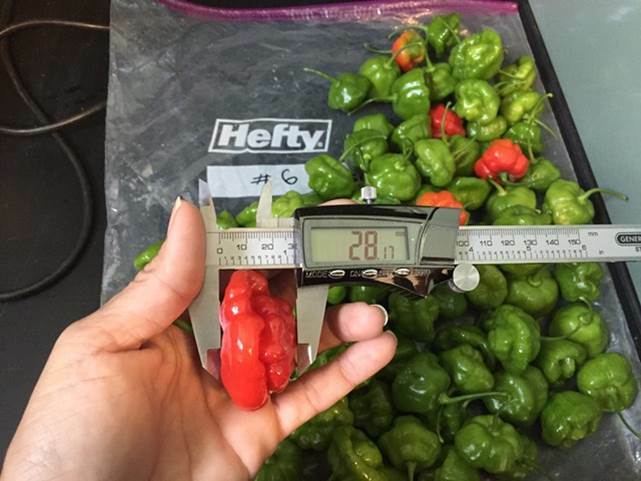 With ají dulce grown at the UMass Research Farm we pack them in a ½ bushel wax box which fits 10 pounds (Figure 28). In many markets we work with in Massachusetts, ají dulce is packed in cellophane-wrapped trays (Figure 33 and Figure 34 in "Marketing and Pricing", below), and sold loose in farmers’ markets and mobile markets (Figure 29). At a farmers’ market in Puerto Rico, one farmer sold them in small mesh bags (Figure 30) for $2.50 lbs (Figure 31) in June of 2016. Ají dulce is popular among Puerto Ricans, Dominicans and Cubans, so you want to focus on markets that cater to these Latino ethnicities. Given the importance of “bodegas” (Latino corner stores) in Latino culture, we have marketed ají dulce through brokers in the Boston Terminal Market (“Chelsea Market”), who distribute to these corner stores. Many of these bodegas will sell relatively small amounts of ají dulce and thus it may not be cost effective to deliver to individual bodegas (Figure 32). 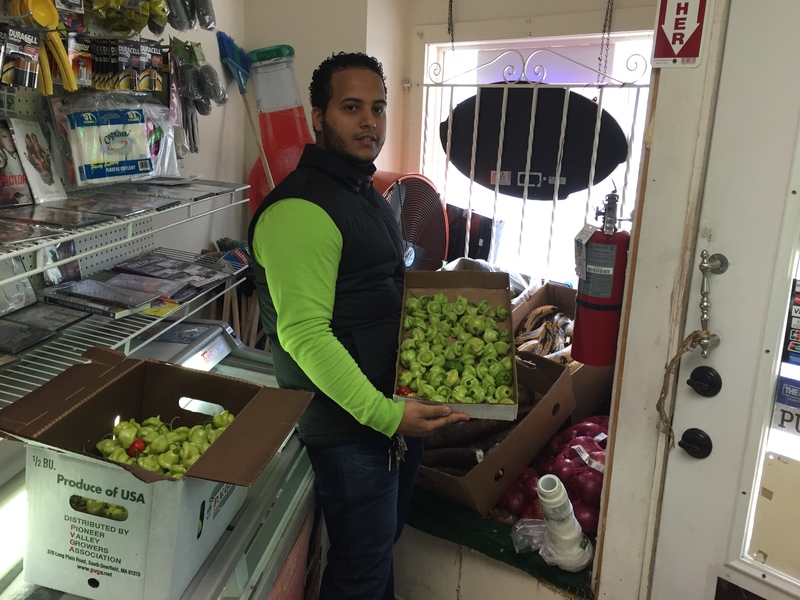 Supermarkets and large independent Latino stores located in neighborhoods with large Latino populations also carry ají dulce, and in much larger quantities than bodegas. In 2015, the wholesale and retail prices of ají dulce in the Northeastern United States increased dramatically after the USDA imposed a quarantine on 18 fresh fruits and vegetables coming from the Dominican Republic, including all peppers, due to the existence of Mediterranean fruit fly. We saw retail prices as high as $13.99/pound in markets in Massachusetts before we started harvesting in late July and after our last harvest in mid-October (Figure 33). 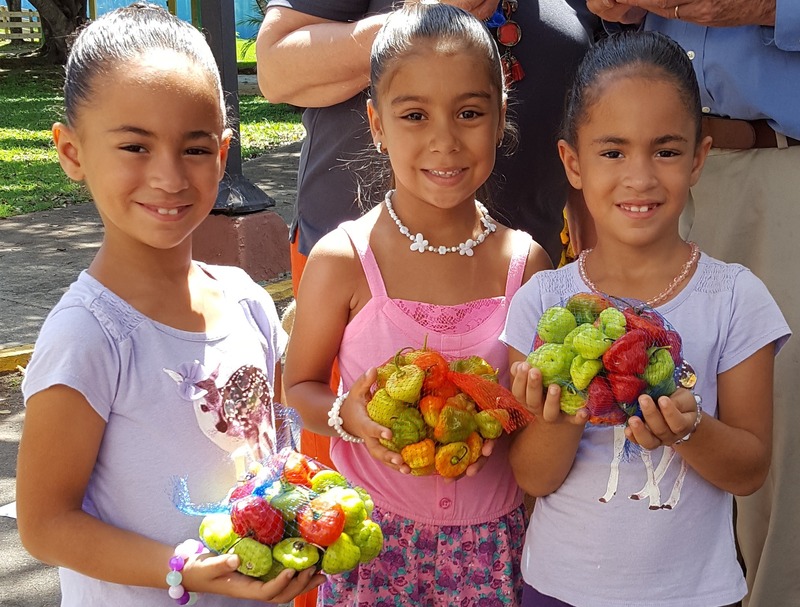 On January 6, 2016, APHIS announced that it lifted the quarantine on all crops coming from the Dominican Republic, including peppers. Both the wholesale and retail prices for ají dulce dropped dramatically after the Dominican Republic returned to exporting to the United States. During the field season in 2016, the wholesale price for ají dulce grown in Massachusetts was between $1.00 and $1.50/lbs. 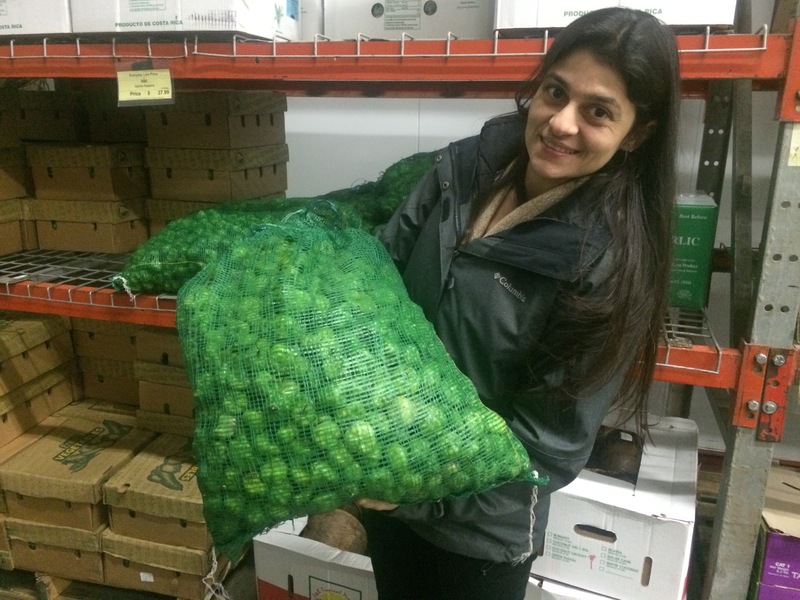 The retail price was between $3.99/lbs and $5.99 lbs (Figure 34). 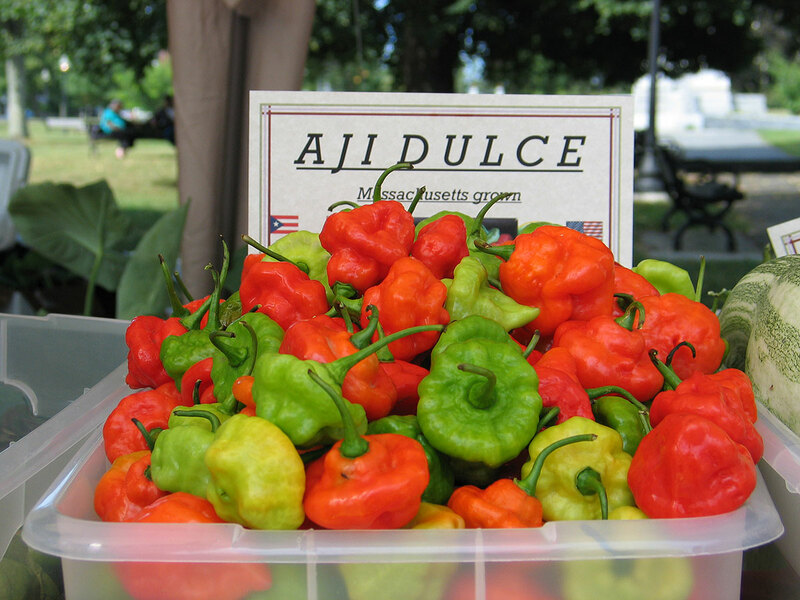 One urban grower was selling ají dulce on the streets of Holyoke Mass., grown in the city (Figure 35). We recommend the use of enterprise budgets to assess the cost of production for any crop a farmer is growing and use this information to establish a viable retail or wholesale price. This file shows the enterprise budget prepared for ají dulce grown at the UMass Research Farm in 2015. This video can be used by anyone wo wants to promote this healthy recipe of sofrito. If one does use this video, we request that credit is given to the Stockbridge School of Agriculture at the University of Massachusetts, Amherst. Brown, C., C. Clement, P. Epps, E. Luedeling and S. Wichmann. 2013. The Paleobiolinguistics of domesticated chili pepper (Capsicum spp.). Ethnobiology Letters, Society of Ethnobiology. Volume: 4:1‐11. Charles Clement. Personal Interview. Instituto Nacional de Pesquisas da Amazônia, Manaus, AM, Brazil, November 24, 2016. Mangan, F. A. Carter, M. Mazzola, M. Rulevich, R. Hazzard, R. Bernatzky, M. Pearson, A. Smith, J.Baranek, P. Harmsen, L. Dow, M. Anderson, L. Colangione, D. Webber, P. Belanger, C. Touchette, and P. Fischer. 2000. 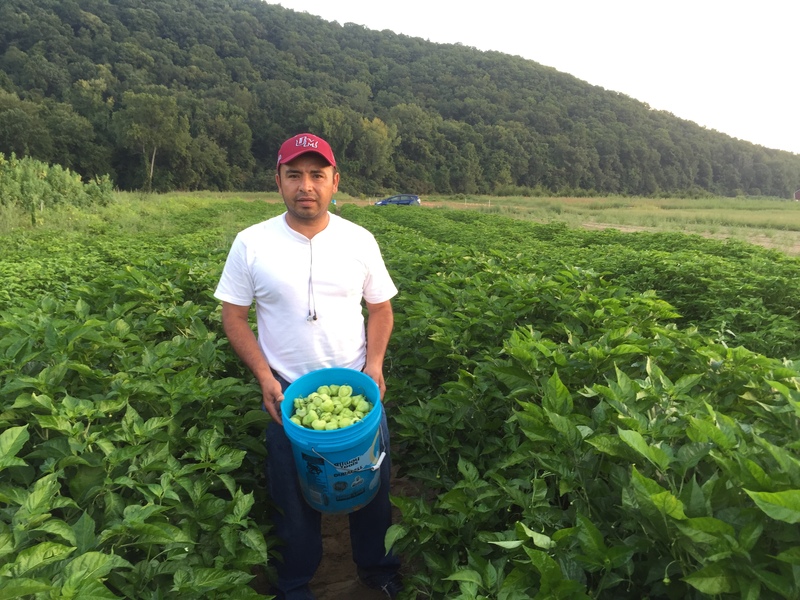 The Introduction of Latino Crops to Farmers in the State of Massachusetts, USA. 1998 Proceedings of the Interamerican Society for Tropical Horticulture. 391-393. Sofrito puertorriqueño. Sazón Boricua: Recetas, Estilo de Vida y Viajes. http://sazonboricua.com/sofrito-al-estilo-puertorriqueno/ Accessed on October 31, 2016.